Leftover Cuties is only now about to release their debut album Places To Go, yet they played to a packed house at The Hotel Cafe in late 2008. In fact, YOU may have heard them already and don’t even know it. Yes, the catchy theme song of Showtime’s The Big C is the product of a Leftover Cuties five minute jam session. Fast forward about three years and we finally get to see what Leftover Cuties are really made of. Places To Go has a definite mood to it. Toe-tapping and smile-friendly, this is a feel-good album perfect for a day at the beach or a nice, scenic drive. Plenty of fun instruments including an upright bass, an accordion and a very fun ukulele provide the perfect backdrop for McAllen’s especially sultry voice. I can already see someone calling this album retro and I wouldn’t blame them, but it would be selling the album short. I’d call it current with a retro twist, pleasing to the ear no matter how you slice it. 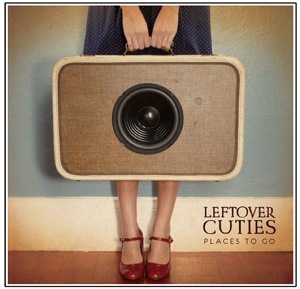 Leftover Cuties’ official CD release show will be June 2nd @ Bardot in Hollywood.